Everytime a new administration comes after every successful Presidential election, Filipino citizens all over the world then awaits the SONA (State of the Nation Addrress) of the new President on his first 100 days. 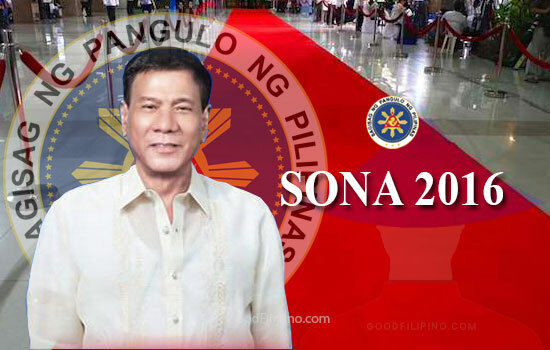 President Rodrigo Roa Duterte will deliver his first SONA on July 25, 2016. We have witness many SONA's before from different Presidents of the Philippines that guest on the venue walks on a red carpet wearing their most beautiful and most expensive Barong Tagalog and/or Filipiñana, makes it feel like gala night party. However, this upcoming SONA 2016 of our new President Rodrigo Roa Duterte, Davao del Norte Rep. Pantaleon Alvarez have proposed that it is better to wear business attires than glamorous barongs and Filipiñana. Alvarez said in an interview via GMA Network said, "Kung ano yung attire pag pupunta ka ng opisina, yun dapat. Hindi 'yung parang pupunta ka ng party,"
"Hindi ka naman kasi kailangan pumorma doon. Business attire is okay na," he added. On the other hand, Rep. Pantaleon Alvarez is still has no idea as to what Duterte would say in his first SONA even though they are known to be close to each other. He said, "I really don't know [what Duterte will say] pero sana hindi katulad [noong pagsasalita niya sa kampanya] kasi mahaba 'yun." Do you agree with Davao del Norte Rep. Pantaleon Alvarez 'No red carpet & glamorous gowns and suits ' on SONA 2016? Please took the comment box below and share your thoughts. Comments or suggestions about "'No red carpet & glamorous gowns and suits' on Duterte's first SONA 2016" is important to us, you may share it by using the comment box below.